Yesterday we trekked from Namche to one of my very favorite Sherpa villages, Thame. At 12,500 feet above sea level, Thame represents a reasonable altitude increase for our team’s acclimatization. The real reason we visit here however is the serenity, beauty and remote feel of this village that serves as a gateway to the Nangpa La and trade with Tibet. Thame is also important in climbing history because it is the village that claims Tenzing Norgay, Ang Rita and Apa as well as many other accomplished climbing Sherpas. 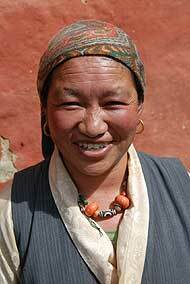 On this visit we saw the wife of one such man Aarita, brother of Apa and one of Berg Adventures regular climbing Sherpas. Aarita is in the Icefall working today with the rest of our Sherpa team, so it seemed fitting that we got to visit with his wife back in his home village before we continue toward Base Camp ourselves. Those of you who regularly follow BAI dispatches from treks and expeditions in the Khumbu will remember little Lhakpa Sherpa, who always enjoys working on our Panasonic Toughbook while we are in town. This year Lhakpa was introduced to Scrabble by Sean Moore and he quickly picked up the game, offering Sean suggestions for words to play. This morning we walked up the hill to visit the Thame Monastery. When BAI was last here in Thame last May, Mani Rimdu, the Dance Festival was about to begin. Our friends from Alberta, Pat and Biaba Morrow and Laurie Skreslet as well as Frances Klatzel from Kathmandu attended Mani Rimdu at Thame and came back with great memories of this special time. Since the close of the festival most of the summer has been spent with the monks in meditation. In fact today we were not able to see the Rinpoche as we often do, because he was meditating. We very much enjoyed being in the monastery however. It is a peaceful and a powerful place. One can feel the 350 year history of this spiritual spot as you walk up the hill past the ancient mani stone carvings to the monastery itself. Aarita’s wife had joined some of the monks who were helping prepare a lunch of Tibetan “Mo Mo’s” or meat dumpling pies. We took salt butter tea and watched the team work hard to make lunch for 35 hungry monks. We called it the “Lama Mo Mo Factory”. One of those 35 monks is Aarita’s son. In the coming weeks as we climb and work together on Everest it will be gratifying for us to know that the money Aarita makes as a climbing Sherpa is helping to keep his son studying at one of the oldest monasteries in Nepal. We are off down the trail again this afternoon bound for Khumjung. Early this morning before we went to Thame Monastery, I call the Khumbu Lodge and spoke with Leila and Jimmy Chin. Jimmy had arrived in Namche yesterday afternoon and said that he was feeling great. Considering he had flown directly for the US, with one night in Kathmandu, then an early morning flight to Lukla and a long trek all the way to Namche I find that impressive. This afternoon we will all meet in Khumjung. We still have a long trek ahead to Base Camp. We intend to take our time, soaking in the rich culture of the Sherpa people, allowing our souls to get in tune with the gods in these hills and allowing our bodies to adapt to the thin air. It will be great to have the entire team together beginning today.